I've been in love with this recipe since day one for two reasons. One, it's ridiculously easy to make that I would dare an 8-year-old to screw it up. Two, this version of Nigella's mango refrigerator cake skips heavy cream and condensed milk, meaning it packs less calories. It's sooo good that I want the whole world to know how to make it. 1. Place vanilla yogurt in a bowl. Top generously with whipped cream (I say about 6 seconds or until the surface is covered). 2. 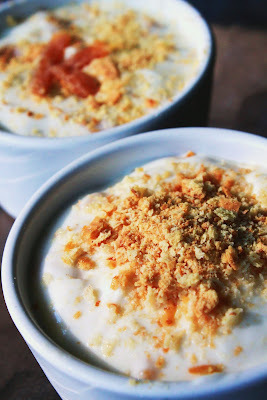 *Cut dried mango strips into chunks and mix with yogurt and cream. The only way to screw this up is if you don't get the sweet ones. For best results, get the ones made in the Philippines. 3. Layer cracker in an individual cup and top with cream. Repeat. Crush remaining graham cracker to garnish. Top with more dried mangoes or nuts, or both! 4. Place in the refrigerator for at least 2 hours before serving. You can find the original Nigella recipe here.